That, up there, was my nail polish collection on March 27th, 20ll. It all fit into a little pink dollar store basket. Now, at the time, I thought I had a pretty well rounded collection, decent colour selection, varied brands, but I wasn't in love with my method of storage. Fast forward a few months, when I was planning on what furniture I was going to add to my bedroom, I found an old dresser that had excellent potential for makeup/polish storage. My friends were fast to make remarks that most people put... well, you know, clothing in dressers, but I, am not most people. What you see above is my nail polish collection on Dec.17th, 2011 when everyone moved into their new home. I had enough drawers to be able to have one dedicated to just polish and a second dedicated to everything else nails (treatments, base/top coats,nail art supplies and what not.) Just look at those neat rows of polish, all organized by brand... but I didn't expect to fill that much of my nail polish drawer from the get-go, but I still had some room to grow. How much more could I accumulate anyway? 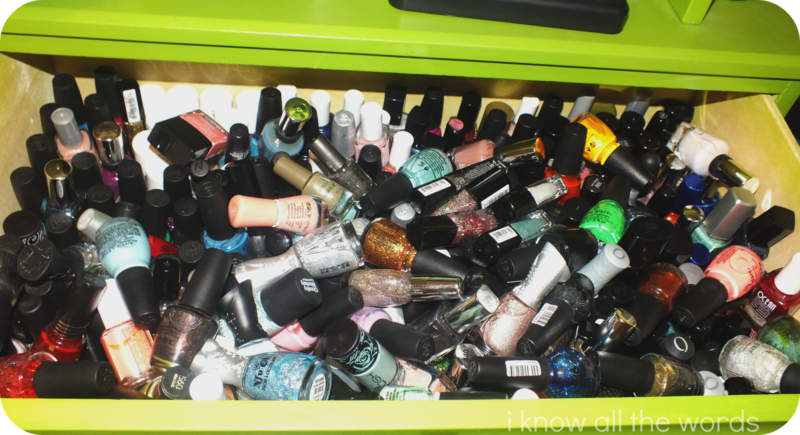 That is what my polish drawer looked like this morning. Gone are the 'neat rows' of before, and brands... well wherever they land, there they are. It was nothing short of a hot -yet colourful- mess. I've obviously out grown the drawer. To try and remedy my polish issue, I turned to my new favourite storage container: empty Glossy Boxes! If you haven't seen one, they're made of heavy, coated cardboard and are a very pretty pale, dusty pink. I have been using my collection of them to organize products I need to photograph/blog, but my polish dilemma was more pressing. All (relatively) neat, but can you spot the Gosh that's made it's way into the OPI section? While I still don't have much room... okay, it's still full, I have at least regained a bit of order. Do you have a large nail polish stash? How do you store it?